News from the Emerald Isle for the start up of the 2005 season sees the 10-a-side competition underway with two rounds completed so far. This season's 2005 Super 10s competition has been broken up into two conferences with Cork (Leeside Lions), Clare Crows and new side West Dublin Saints competing in the southern conference and Dublin Demons, South Dublin Eagles, Mullingar and Belfast hitting it out in the Northern Conference. In the past, difficulties in travelling to games has been a feature of the 10s and Premier season with numbers on the road inflicting weakened, smaller squads or forfeits. A conference system has been introduced this year to help promote more competitive matches and reduce travel times for players and clubs who have other commitments outside of football. With the development of the new club the West Dublin Saints, the ARFLI is looking to introduce football to a wider community and accommodate players in the western part of Dublin and increase the gospel of Australian Rules Football to the wider community of Ireland. Things are looking promising for the new club which has already had a solid victory in the Super 10’s tournament to date against last season's Semi finalist the Crows in round one of the competition. There has been a fifty percent rule of Irish players to Australian players on the field at any one time enforced on clubs this year in order to help develop the Irish based players who are the key ingredient of the National Squad and maintaining a hold on the International Cup. This rule will help to maintain local interest in the competition and also allow players with a similar background and skills to gauge how they are developing. With the assistance and input from Australian born players on and around the ground, in time, there should be long term benefits for all participants in the Irish league. Other news of interest is that the South Dublin Eagles have managed to secure an arrangement with hosts Terenure College to extend their playing ground a further 20 meters in time for the ARFLI premier season. This is great news for all clubs concerned in the league and should allow for a more open game for all visiting sides who have been troubled by this issue in the past where one tap down to one kick down to one goal was a common occurence. 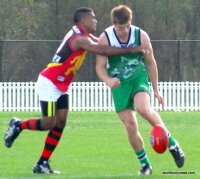 With the excellent facilities secured by all clubs this year, the new rules in place and the reconstruction of some of the competitions past contentious issues, it all points to a strong and competitive season for 2005.